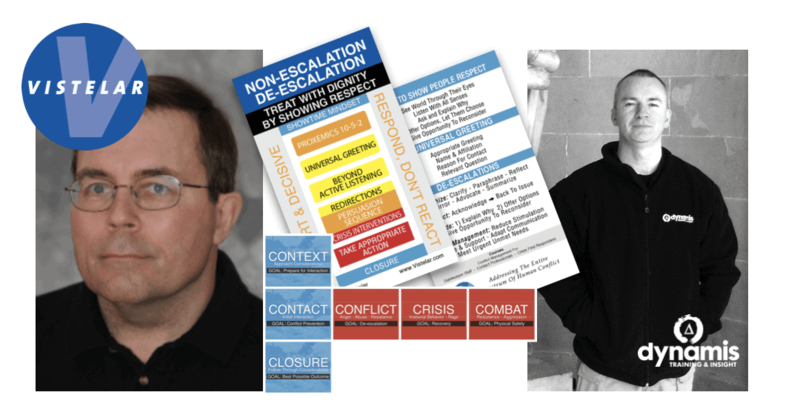 A transatlantic collaboration which began in 2014 between conflict management specialists Vistelar in the USA and workplace violence prevention experts Dynamis in the UK is reaching a milestone event. In response to the needs of healthcare security officers from hospitals in London and the South-East, the West of England, the North of England and in Scotland, Dynamis and Vistelar have been collaborating on the design, development and delivery of a customised training course in conflict management for a cadre of trainers from the United Kingdom. Reaching back more than 25 years, the core elements of the training programme have been tried and tested by contact professionals deeply involved in mental health, crisis intervention, nursing, law enforcement and hospital security to successfully defuse and de-escalate potentially dangerous situations. These challenges converge with important changes in social attitudes. Healthcare staff are reporting greater difficulty in de-escalating the general public, compared to years gone by. We now also know more about how previous trauma influences behaviour in crisis situations and how it effects the resources staff can bring to bear in high-stress encounters. Healthcare security officers, working in support of their clinical colleagues within the NHS, are increasingly called upon to support nurses, doctors and healthcare assistants in situations where conflict, aggression and violence are impacting on the patient experience and the safety and security of the hospital setting. An analysis by Dynamis showed that the Vistelar training programme, known as ‘Verbal Defense and Influence’ could be leveraged to provide a standardised and effective approach to managing Crisis Intervention, Conflict Management and dealing with Emotionally Disturbed people in the hospital setting. The Vistelar programme, delivered in collaboration with European Advisor Gerard O’Dea at Dynamis, incorporates key ideas such as how to treat people with dignity by showing them respect, even in the most challenging circumstances. The underlying emphasis of the programme is that verbalisation skills, derived from values-based interaction approaches like empathic listening, collaborative persuasion and procedural justice, can break down communication barriers and reduce incidents of aggression and even physical violence.